Caption slip reads: "Photographer: Wyman. Date: 04-21. Reporter: Parker. Assignment: Jet ace in San Bernardino. (For Sunday ). Bernice Love, wife of Air Force Capt. Robert J. Love, shown in San Bernardino home holding her daughter Malinda, born March 29th. 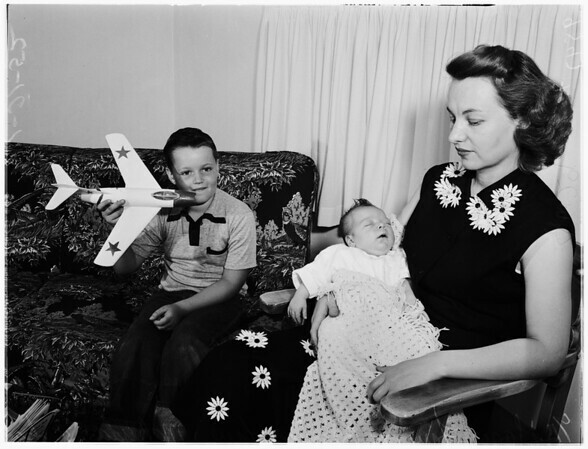 Seated beside her is son Gary, 8, holding a model of Soviet MIG 15 fighter like the five his dad has shot down in Korea to win ranking as an ace. Copy fotos of Capt. Robert J. Love, Air Force jet ace in Korea. (Return copy fotos to Mrs. Bernice Love, 2895 Davidson Street, San Bernardino)".